Great weather and good fish. Weather has been just perfect over the past week with some cool mornings producing bright sunny days. Ok, itÂ is not ideal for fishing but if you are out and about early you should have found some good results. Tongariro rainbows are now in full swing and many fish are pushing in every night which are welcomed by anglers most mornings. Last week was hectic on the rivers but this week has been very quiet in comparison. Good condition fish still seem to be showing up in anglers catch bags and are a lot better than the last couple of years but one should still expect a few under conditioned fish mixed in which have missed out on the weight gain from the year in the lake. 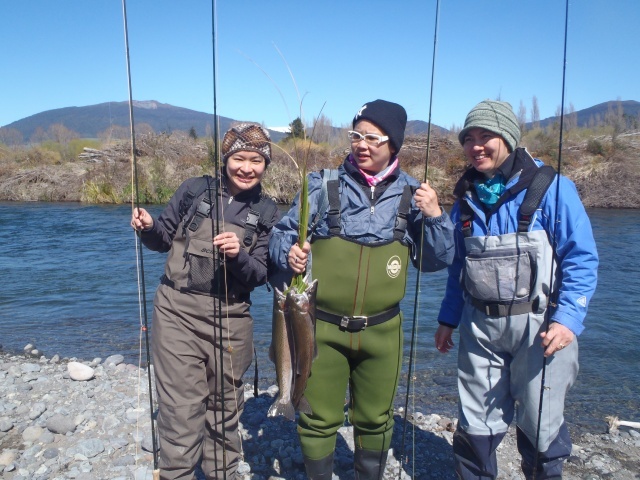 The Waiotaka and Waimarino have both fished well over the last week and some good reports have been heard from some anglers which are good at small streamÂ stalking. 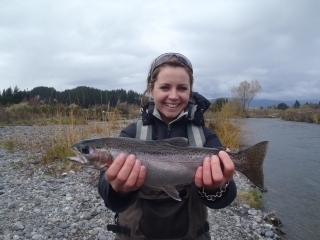 These rivers are a fantastic option when you want to sneak about with a 6wt rod, escape the crowds and hook into some solid fish which will give you a hard time onÂ a tight river.The more anglers which fish up these smaller rivers the better as it relieves pressure from the TongariroÂ andÂ puts more of a precence on the more delicate rivers which can be subject to poaching. I have not fished the smaller rivers closer to Taupo over the past few days as all my clients have been staying in Turangi but I am fairly sure the Hine has slowed right down with spawning fish but is holding spent and tired trout. 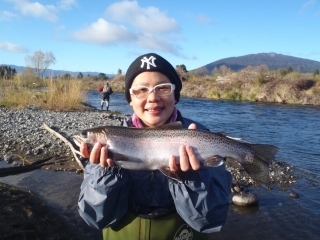 The Waitahanui has again been ok up Blake Rd but hitting the pools early is again a vital key to catching something in here as this area has attracted a lot of guides lately with rugby clients. I have again had quite a few fish on the wet line and have enjoyed that feeling of a hard hitting fish pulling in the opposite direction as it strikes. Clients have actually enjoyed learning both methods and are showing more skill in swinging the wet fly than getting a natural drift with a nymph. Both methods are vital techniques in any experienced anglers day but both methods have their place, something I would not have said 6 months ago. Woolly Buggers, Red Setters and any Rabbit patterns has been good in the mornings with small naturals being the best nymph patterns such as PT variants, Caddis and Prince Nymphs. There seems to be fish in most of the river at the momentÂ and success seems to be sitting nicely with everyone. Those who have taken advice and headed up river to escape the mobs of fisherman have enjoyed the scenery and the fish without being pressured . As I said before there are not many fisherman on the water this week and the lower river has again been a pleasure to be in. Even the bridge had no anglers when I went passed at 7am which is most unusual. Saturday is October 1 a date which isÂ set in stone for many anglers to explore rivers which have been closed for months. I am not sure what I will be doing yet but I am watching the weather likeÂ a Hawk as we are due some in the next few days which may cause problems on some of those smaller creeks. There are so many options for everyone to choose and I would think the local rivers here in Taupo may be quiet for once so it might be also a good time to stay put. I have clients on Sunday so my backcountry trip will be limited to a day trip on the Saturday to an area like the Whakapapa, Whanganui or Mohaka??? So much water so little time! Anyway have fun people and check in soon.